Dental Trauma- Knocked Out Permanent Tooth Education Flier. 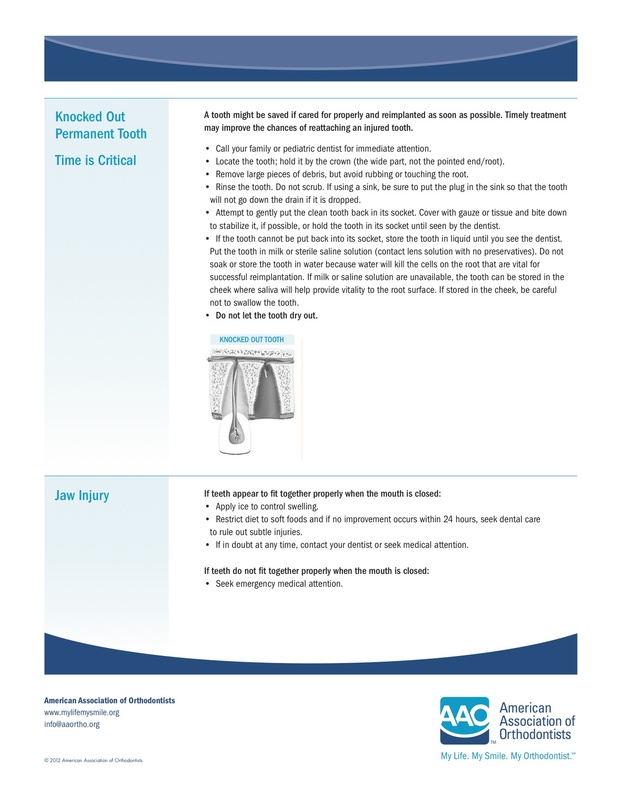 This is a publication by the American Association of Orthodontists to help educate you on what to do in case a permanent tooth is knocked out. 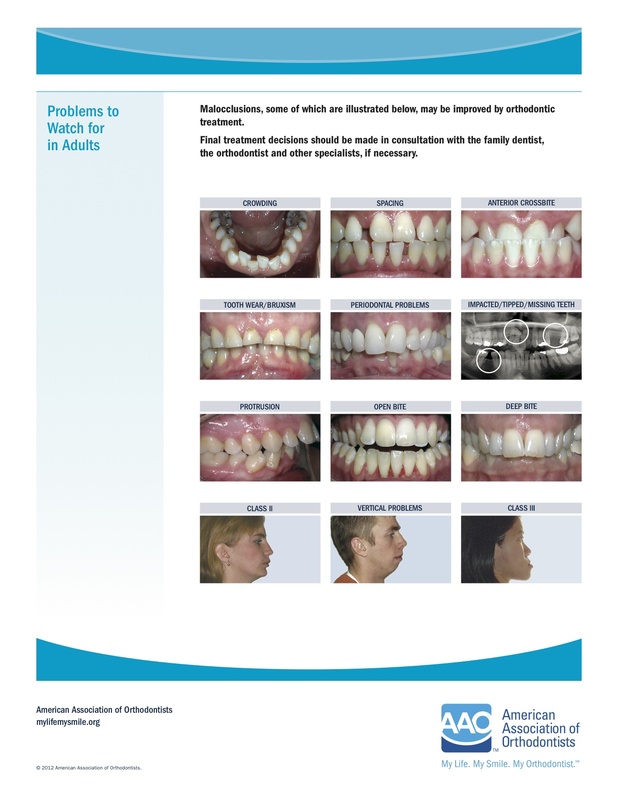 Orthodontic Problems to Watch for in Adults. Orthodontic braces work by using brackets that are glued onto you teeth. These brackets have small slots in the front surfaces of them and it is into these slots that the orthodontic wires fit into place. These wires are held in place by small elastic ties that fit around the brackets. Over time, these wires put pressure on your teeth and this moves your teeth into their proper positions. The brackets (braces) that most orthodontists use these days are not all the same. Each of your teeth has a different size and shape to them. The brackets do as well. So, for instance, a bracket that is made for an upper front tooth (incisor) would not fit correctly on a lower side tooth (bicuspid). Each of these brackets is custom made for the particular tooth it is supposed to fit on. They have different thicknesses, and the slots that the wire fits into are made at just the right angle for that particular tooth. This system of making the braces to fit individual teeth and to have the slots made at just the right angle to move the teeth to their ideal final positions was developed by an orthodontist named Lawrence (Larry) Andrews in the 1970’s. He is a really smart guy, and very nice by the way. Anyway, this is the type of system that most orthodontists use these days. Before Dr. Andrews developed this system, all of the brackets had the same sized slot cut into them. That meant that the orthodontist had to put individual bends into the wires for every individual tooth in the mouth. That system worked, but it was a total pain for both the orthodontist and the patient. It takes a long time to put all those bends into the wires, and it hurts when one of these wires with all these bend on it is pushed into the brackets. 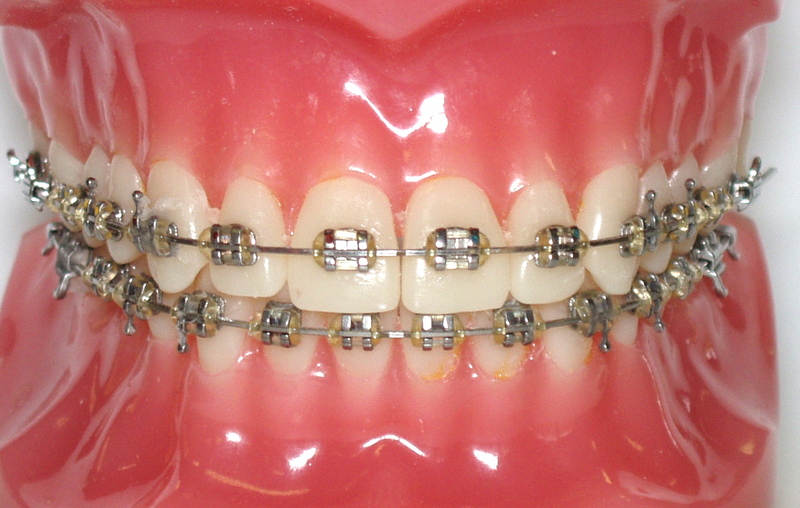 The other aspect to how braces move your teeth is the wires that are used. Back in the day, orthodontists had stainless steel wires and that was about it. These days, orthodontists have a number of different high-tech wires to use that move your teeth faster and more comfortably. The first wire or two that an orthodontist will use on your teeth are very flexible. They almost feel like rubber. This is beneficial in a number of ways. These flexible wires put a more regulated and constant force on your teeth. This means they are not only more comfortable, but they also move your teeth faster and you don’t need to get them adjusted as often. As the teeth straighten out, the orthodontist is able to put in progressively thicker and stiffer wires until you get to those stainless steel wires mentioned earlier. 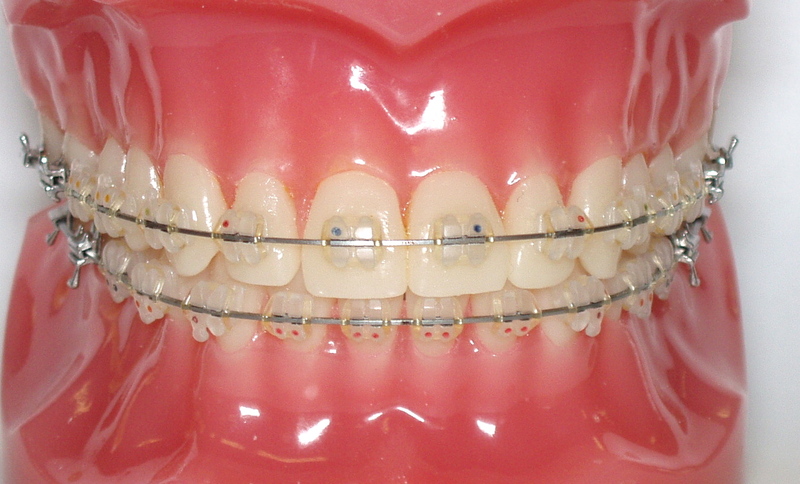 Most people that have braces will need to wear elastics or rubber bands. These typically go from one or more of the upper braces to one or more of the lower braces. These elastics pull on your teeth and move them in the direction that the need to move. I’ve mentioned several times in this post about how the braces/wires/elastic put pressure on your teeth. This pressure is transmitted from the teeth to the bone that surrounds them. The bone responds to this pressure and ‘remodels’ around the tooth. Some bone is taken away in some areas and added in other areas around the tooth, depending on the direction it is being pushed. That is pretty much how braces move teeth. If you are interested, you can check out our website for more information. This is an example of a patient with severe crowding of the lower front teeth. The best treatment option was to have one lower incisor removed. This was due to the amount of crowding and the thin gum tissue of the front of the lower incisors. When a patient has thin gum tissue on the front of the lower front teeth, they will tend to get an increased amount of recession of their gum tissue on these teeth if they are move too far forward. This time lapse video shows how the teeth moved from the start to the end of treatment. This is not a very common treatment, but when it is indicated, we can get some very nice results. For more information on our practice click on the link below. Most of the time, we can treat people without the need to take out adult teeth. Sometimes, however, due to the significance of the crowding removal of adult teeth is the best choice of treatment. There are also situations where the patient could be treated with extraction of some adult teeth, or non-extraction and the patient/parents choose the extraction option. This video morphs several panoramic x-rays to show how the adult canine teeth erupt into place after the removal of the upper first deciduous (baby) molars and the upper first bicuspids. One of the most common teeth for people to be missing is an upper lateral incisor. Typically, there are two treatment options. One is to open up a tooth sized space to allow for a future implant or a bridge to be placed. The other option is to move the back teeth forward on the side of the missing tooth and substitute the canine tooth for the missing lateral incisor. This video shows what it looks like to do a canine substitution. The canine tooth is flattened down to make it look like the lateral incisor on the other side. Feel free to check out our other patient education videos, as well as the ‘fun stuff’! The first step to starting Invisalign treatment is to get an exam at our office. The exam is free. At the exam we will determine whether or not you are a good candidate for Invisalign treatment. Invisalign is really good at what it does, but there are certain situations where Invisalign will not work very effectively. A key to remember is that Invisalign works for teens and adults. Kids that still have baby teeth, or adult teeth that still have to grow in a lot do not qualify. Once we determine you are a good candidate for Invisalign, we take records. The records include photographs of your teeth and face, dental impressions of your teeth, and two x-rays. We send those records off to Invisalign with detailed instructions on how I want the teeth to be moved. Invisalign then scans your impressions, so that they have a 3D model of your teeth in their computer. Their technicians will move the teeth step by step in the computer model to their final positions. I then log on and review the movements of the teeth. Typically, they get it pretty close, but I have to instruct them on some fine point details of how I want the teeth to be moved. They make the changes, and then I review them again. I usually need to do this a couple of times to get the teeth exactly where I want them. Once I am satisfied, I ask Invisalign to go ahead and make the trays and mail them to our office. It usually takes about 4 weeks from the time of the impressions until we get the trays back to our office. Then you are ready to start straightening your teeth! The way the system works is you wear a set of Invisalign trays (called aligners) for two weeks at a time. Each tray is manufactured so that the teeth are slightly straighter than the previous tray. The teeth will typically move 1/10mm per tray. So when you put a new tray in, the teeth in the tray are slightly straighter than your teeth are. This puts pressure on your teeth, and over the course of two weeks your teeth will move so that they match the tray. Most people that get Invisalign treatment have crowded front teeth. So if you think about crowding, there is not enough room for the teeth to fit. We need to make more room somehow and we do this in several ways. On most people, I will have the trays do some expansion of the back teeth. This does several beneficial things. One, it makes more room to correct the crowding in the front. Two, it makes for a broader smile, which also looks better. For a lot of people, we will also bring the front teeth forward slightly. A third way we make more room to correct the crowding is to make some of the teeth slightly skinnier. This process is called interproximal reduction (a fancy way of saying we do a little bit of sanding or filing in between some of the teeth to make a little bit more room). This is not something that you can readily see and it stays well within the enamel of the tooth so that you don’t get sensitivity later. On a lot of people we also need to use something called ‘attachments’ on the teeth. Attachments are small, tooth colored, bumps of plastic material (composite) that we need to put on some of the teeth. Basically, what they do is to give a handle or gripping point for the aligner to click into place around. They help the aligner stay on better and they also can put pressure on the teeth in the direction we need to straighten them out. Not everyone needs these, but a lot of people do. Sometimes we will also ask people to wear rubberbands with their aligners. This is very similar to what we would ask a patient to do with traditional braces. We will use these to rotate a particular tooth, or if they are worn from the upper aligner to the lower aligner, they are used to help correct the bite. I will ask most people to wear their aligners close to full time. A major advantage of the Invisalign system is that you can take them out to eat. We also ask you to take them out to brush and floss and you clean the aligners with a toothbrush at the time you are brushing. Typically, this means you will have your aligners in for about 20 hours a day. If you do not wear your aligners this much, the teeth will not have moved to their final position for that particular tray. When you go on to the next set of trays, they will not fit quite as well. This has a cumulative effect and by the time you get 3 or 4 trays down the line, they will not be fitting well at all. Most of the time (I would estimate about 70%) we will get finished with your last tray and there will be a few teeth that are still slightly out of position. I tell people this ahead of time, because it is pretty normal. If that is the case, we take a new set of impressions and I have Invisalign make us some more trays to detail things. The process for this is identical to what I described earlier. The new trays will come back in 3-4 weeks and we will continue with straightening your teeth. Invisalign refers to these as refinement trays. There is not an additional fee for this, it is part of the process. Most people need to get 1 set of refinement trays. Invisalign allows us to do this up to 3 times, but in my experience that is very rare. Once we are done with your final trays, it is time for retainers. Most Invisalign patients chose clear plastic retainers that look like Invisalign trays. Some people choose to get a fixed (permanent) retainer on the inside of their lower front teeth. This is a wire that goes across the inside of your lower front 6 teeth. The choice will be yours as to what kind of retainer we use. I ask most people to wear their retainers full time for 2 months and then we cut back to just while sleeping. Eventually, we get to the point where you are just wearing it a night or two a week. People often ask why we need to use retainers. The simple fact is that nothing about your body remains constant. It all changes as we age and that includes your teeth. Biting and chewing can put a lot of pressure on your teeth, and over time, these forces can move your teeth around. Well, that just about does it. If you have any questions please feel free to call our office (579-0903) and we can set you up for an exam and get you that winning smile you have always wanted! You can also check out an Invisalign informational video on our youtube channel. We recently had a nice write up in the Explorer Newspaper. It tells about Dr Kyger and has a quote from one of his patients about how her orthodontic treatment changed her life. Check it out! 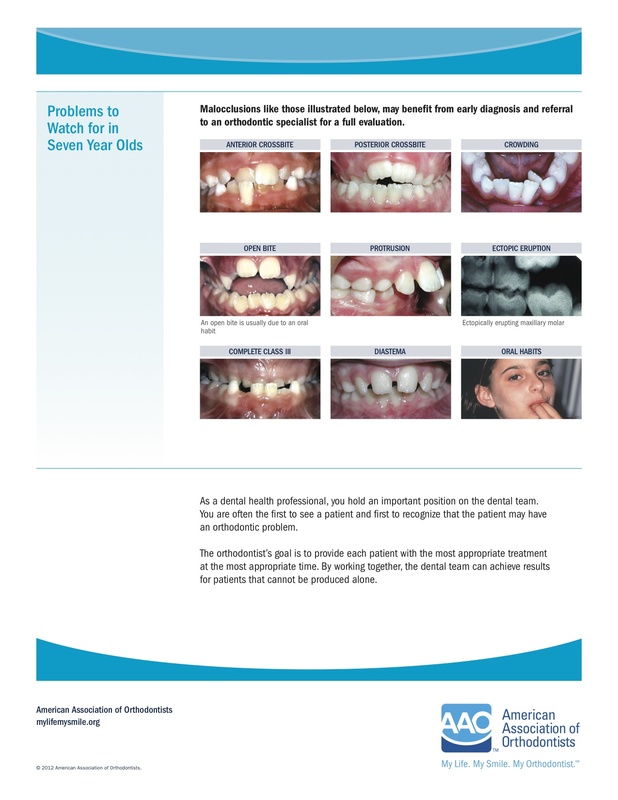 At What Age Should My Child Have Their First Orthodontic Check-Up? At what age should my child have their first orthodontic check-up? The American Association of Orthodontist recommends that your child get their first orthodontic check-up at age 7. The reason for this, is that the adult front teeth (incisors) and the first set of adult molars should be grown in by this time. By looking at how these adult teeth relate to each other, the orthodontist is able to make a good determination about how the teeth are developing and how the growth of the upper and lower jaw bones are relating to each other. Most of the time, no treatment is needed at this age, but occasionally there are some conditions that need to be corrected at a younger age. Studies have shown that if a child has an overbite that is greater than 7mm, there is a much greater risk to the upper front teeth being cracked or knocked out in a fall. Also, a crossbite of the back teeth on one side can lead to the lower jaw growing to one side more and not straight forward. If you have any questions or concerns, you can check our website at: KygerOrthodontics.com. You can also call our office to set up an exam 579-0903. The exam is always free. DrDelKyger on How Does The Invisalign Process Work? M on How Does The Invisalign Process Work?